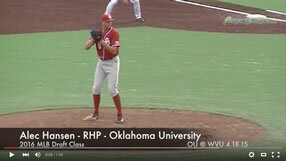 Alec Hansen – RHP – Oklahoma. 6’7″ 235. Class: Junior. DOB: October 10, 1994. Last Drafted: 2013 – Colorado (25th Round). Scouted: The University of Oklahoma @ West Virginia University on 4/18/2015. In 2013, the same year the Colorado Rockies popped flame throwing righthander Jonathan Gray from the University of Oklahoma at #3 overall, they selected Hansen from nearby Loveland (Colo.) High School in the 25th Round. Baseball America ranked Hansen as top draft prospect in the state of Colorado that year and the 136th best overall prospect. The Rockies were unable to dissuade Hansen from his college commitment, so it was onward to Norman. 2015 MLB Draft Prospect: Kyle Cody – RHP – Kentucky. 6’7″ 245. Class: Junior. DOB: 8.9.94. Last Drafted: 2012 – Philadelphia (33rd Round). Ranked as the 267th best prospect in the 2012 draft coming out of a Chippewa Falls, Wisconsin high school, Cody was considered a tough sign and slid to the 33rd round. Though his performance over three seasons at Kentucky has been shaky, Cody figures to go about 30 rounds higher than that this season. It’s important to note that I’m not a scout. I don’t have the training or expertise that they do. I do go to the games see these guys play live, and while there, I talk to scouts. That’s more than you’ll find in some other so called “Scouting Reports” online. Also, while scouts reserve their thoughts on a player for their employer, I can share my thoughts with you, the reader. Fastball: Cody sat 91-94 mph touching 95 once when I saw him and was as high as 97 mph last summer in the Cape Cod League. Though lacking movement, Cody’s height allows him to throw this pitch at a downward plane. Slider: Cody throws a slurvy breaking pitch at around 77-80 mph and threw it a ton against Vanderbilt with inconsistent results. Several times throughout the start he lost the release point. Changeup: An inconsistent offering between 80-85 mph. Cody’s delivery produces some of the easiest velocity I’ve ever seen. Stress free and without any violent arm action, the ball jumps out of his hand, and at 6’7” that hand is half way to home plate by the time he releases the ball. It’s often difficult for big men to repeat their delivery and sensing that, Cody and his college coaches seem to have simplified the approach as much as possible. I’ll be interested to see what a professional organization can do for his development. Cody entered the season as a top half of the first round prospect, but an up and down spring that included temporarily losing his rotation spot for a few weeks have tarnished his stock. At this point, I like him more than most. Though he has an outside chance to go at the end of the first round, it’s more likely he’ll go in the 50-60 pick range. In addition to staring on the diamond, Jay played receiver, punter and returned kicks for Lemont (Ill.) HS. Undrafted out of high school, Jay has been a key part of the Illini bullpen since his freshman year but he vaulted himself into the first round discussion with a stellar stint with Team USA last summer where he put up a season line of 2-0, 0.00 ERA, and 21 K in just 16.2 IP. Jay has continued his dominance this season, posting a 0.60 ERA, good for second best in the nation. There’s a lack of consensus on whether Jay, who has just one career college start, will be used as a starter or a reliever as a pro. There’s more value in a left-handed starter, but if he stays in the pen, he could be fast tracked to the majors. It’s important to note that I’m not a scout. I don’t have the training or expertise that they do. None of that is going to stop me from sharing my thoughts on the player. Fastball: Jay sits at 93-95 mph and can run it up to 98 mph. Slider: Jay’s primary secondary pitch is a wipeout slider at 85-87 mph. Curveball: Jay has flashed a “get me over” curve at 79-80 mph but he will also throw the ball down in the zone as an out pitch. Changeup: This isn’t a pitch that Jay will typically use in shorter appearances as the need generally hasn’t been there when going through the lineup one time. Though not a big guy, Jay can consistently bump a mid 90’s fastball without a particularly taxing delivery as his premium velocity is generated more by superior arm action than effort. The release is a true 3/4, yet he finishes north/south without falling off to the third base side. To start or to relieve? Less than 48 hours before the draft, Jay is projected to go off the board within the top 5 overall picks. I firmly believe that an MLB team won’t spend that high of a pick on a pitcher unless they believe he can start. The last true relief pitcher to land in the top 10 picks was Drew Storen (10th) when the Nationals used their second first rounder on him. Storen wasn’t near the 10th ranked talent in that draft, however they drafted Steven Strasburg at #1 overall which cost them $7.5 Million, so they went under slot at #10 and signed Storen for $1.6 Million.